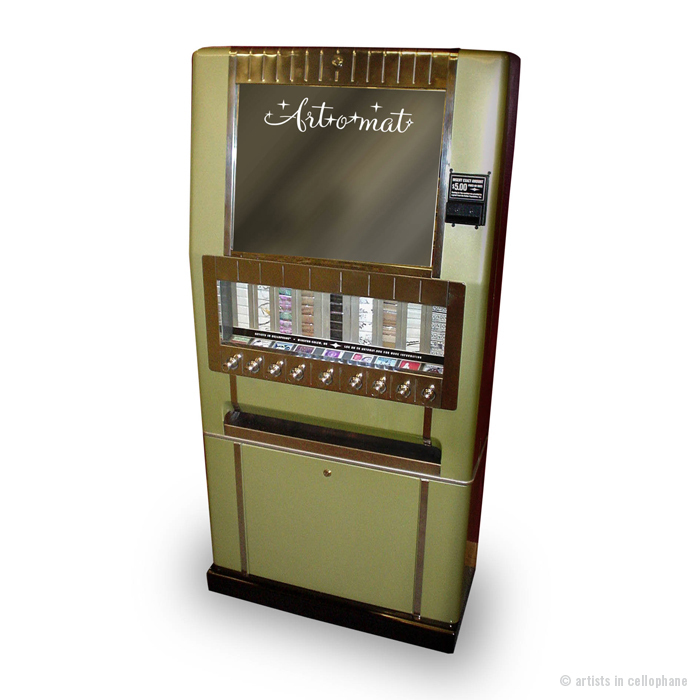 Art-O-Mat takes over: Bye-bye cigarette machines! These vending machines are no longer places to buy a pack of cigarettes, instead they vent out little pieces of art. For only 5 dollars a piece, anyone can become an art collector! Back in 1997, artist Clark Wittington had a solo-show at a local café. He hung some of his artwork on the wall, while also filling a recently banned vending machine with some of his black-and-white photographs. 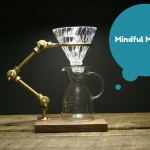 The café owner loved it, and wanted the machine to stay after the exhibition. 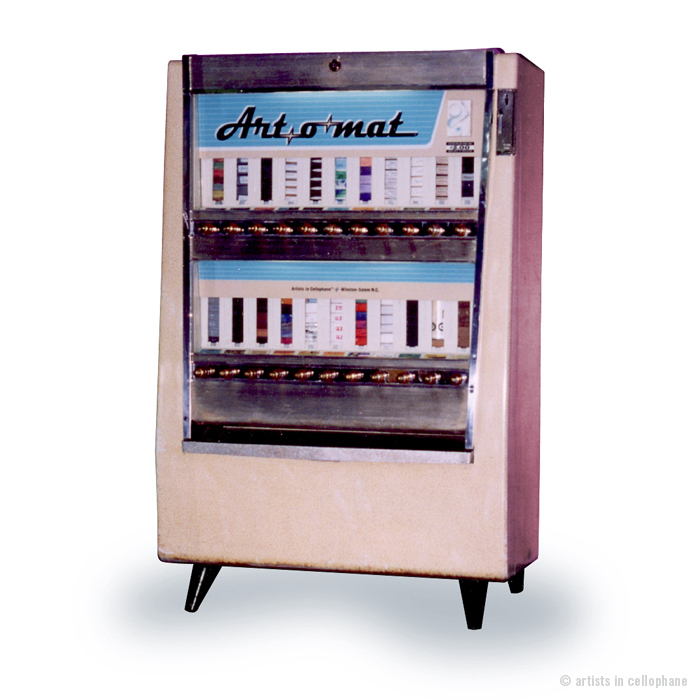 Art-o-Mat was created and more vending machines were converted to sell art. 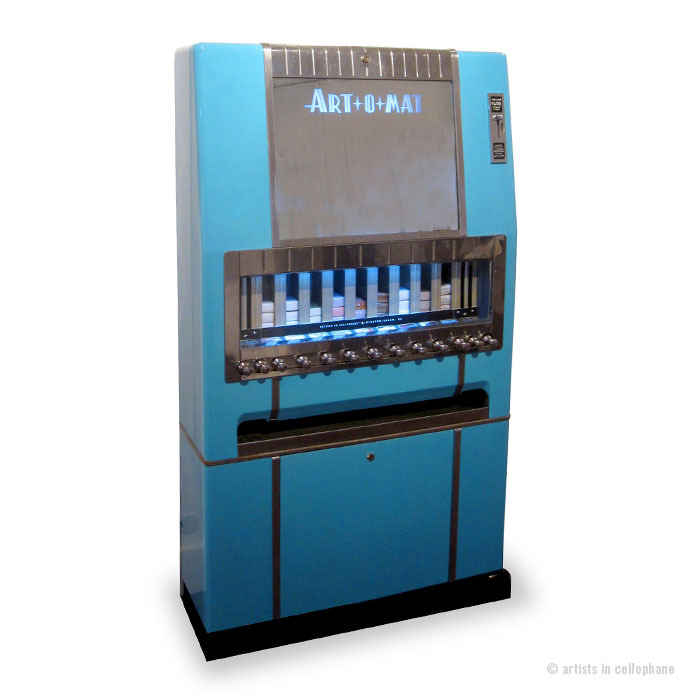 Different artists were asked to sell their work through the machine (the brilliantly named “artists in cellophane”), which works as an exciting opportunity for them to get creative and sell more work. Now it’s not only photographs you can get for 5 dollars a pop, there is knitwear, paintings, drawings, mixed media etc. You can find the machines in all kinds of public spaces across the U.S. and buying and discovering new art has never been easier. 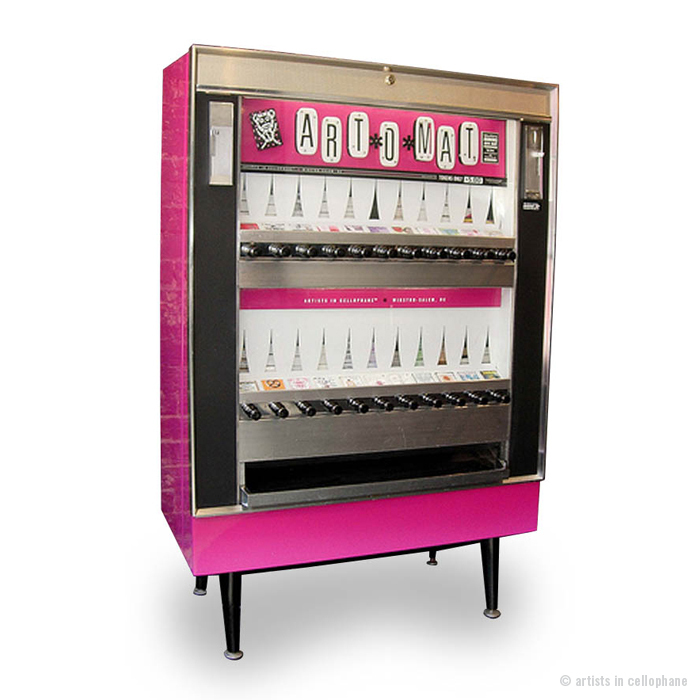 If you don’t live in the U.S. and still want to get your hands on some art-o-mat goodness, you could either plan a road trip and visit all of the 120+ machines. 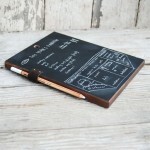 Or, you can simlpy hit the webshop, and order a box of art-o-mat. 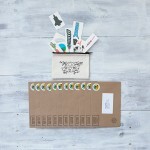 A box contains 10 pieces of art, and will be curated especially for you. The pieces will be selected after you filled in a questionnaire, answering some personal questions. 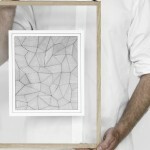 The artwork you receive will actually fit your personality and style! Also, as all of the artwork is of the size of a pack of cigarettes, this is your opportunity to carry around art with you at all times. 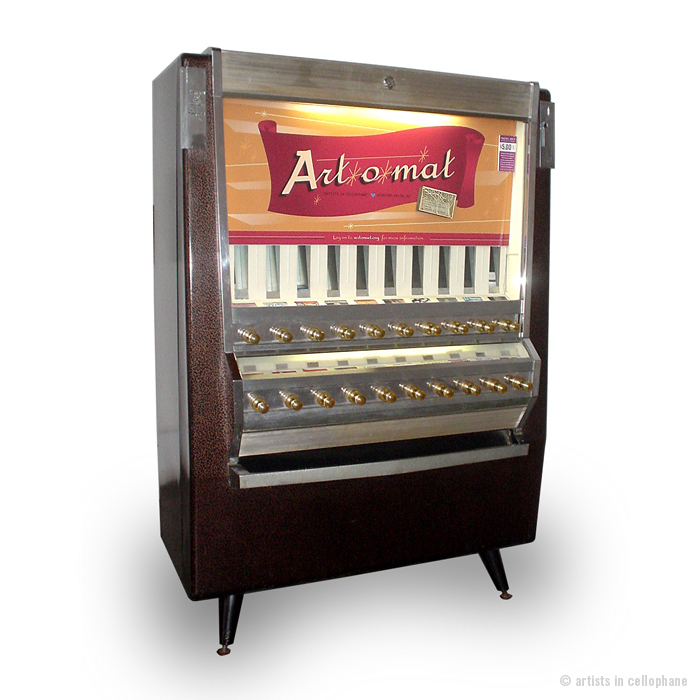 Or as Art-O-Mat puts it: “Don’t go ’round artless!”. 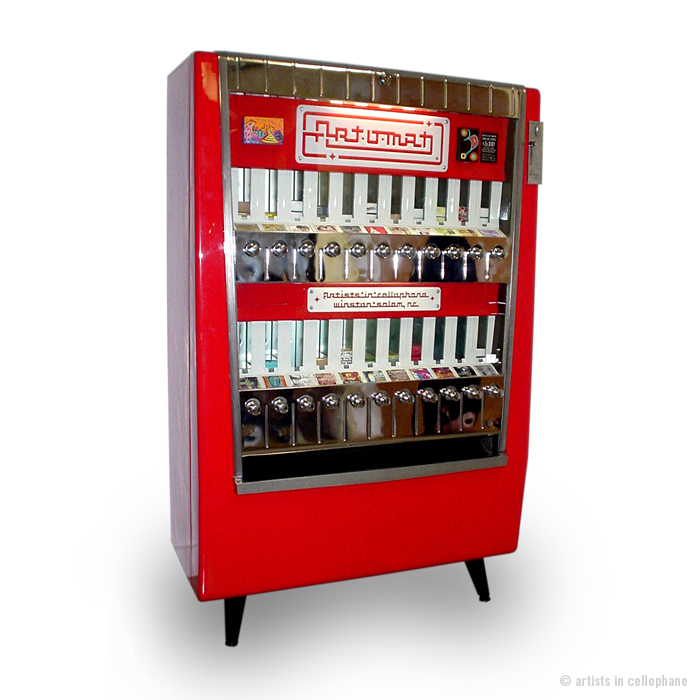 I love this so so much, can anyone please convince the Art-O-Mat crew to take over European vending machines next! ?